We have to be honest. We have no idea what an “ethanol fuel” really means. But Carlsbad has two new ethanol pumps at Bressi Ranch Shell. The station celebrated yesterday by throwing a ribbon cutting ceremony at 2740 Gateway Road. And everyone was there: (Left to right) Ted Owen, president/CEO of Carlsbad Chamber of Commerce; Judy Bishop, executive director of the Ecocenter for Alternative Fuel Education; Mike Lewis, general manager of Pearson Fuels; Fred Reed, owner Bressi Ranch Shell; Debbie Reed, Bressi Ranch Shell. For a list of cars that can actually use these two new pumps click the link for a guide to reading VIN numbers for FlexFuel compatibility. CARLSBAD — October 1, 2008 — Pearson Fuels will celebrate the grand opening of North County’s first Ethanol (E85) alternative fuel station by partnering with the San Diego Regional Clean Fuels Coalition to host a National AFV Day Odyssey event with a special ribbon-cutting ceremony on October 7 at 2:00 p.m. at the Bressi Ranch Shell at 2740 Gateway Road in Carlsbad. 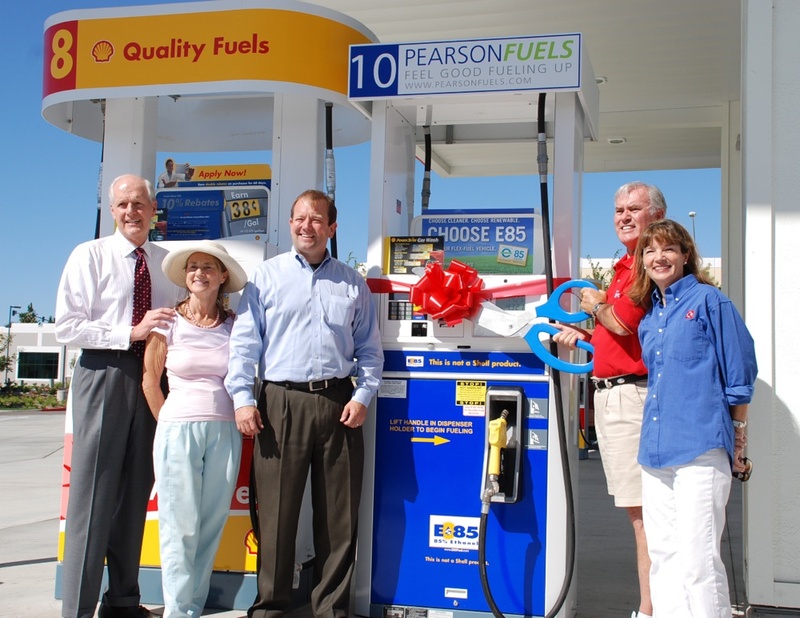 Pearson Fuels, which is celebrating its fifth anniversary of the world’s first Alternative Fuel station, has announced the ribbon cutting and ground breaking of eight new stations throughout California, including Carlsbad. Due to the support of the Clean Fuels Coalition, E85 Ethanol will be available for purchase at the Shell station for $1.85 per gallon from 2:00 p.m. to 5:00 p.m. and free food and drinks will be available to the public. A wide variety of AFV vehicles and experts will be on hand. Each year since its inception in 2002, National AFV Day Odyssey has drawn record-breaking crowds and has allowed millions to hear Odyssey’s message. Building upon the success of past events, Odyssey 2008 is positioned to break all records, with a total of 86 sites being conducted nationwide. In 2006, with 60 participating sites in three countries, the event surpassed all expectations attracting nearly 40,000 attendees. Additionally, Pearson Fuels has announced a statewide roll out of new E85 stations throughout California, including two groundbreakings for stations in Beaumont and Perris on October 8; ribbon cuttings for stations in Concord on October 14 and Hayward on October 15; and groundbreakings in San Jose on October 15 and on October 16 in Carmichael and Sacramento. Pearson Fuels opened in 2003 as the world’s first Alternative Fuel Station. From day one the station offered an amazing number of firsts in what most people thought was the mature retail fueling industry. Specializing in bringing alternative fuels to the public, Pearson brought the first Ethanol station to the state of California, the first Biodiesel station to San Diego and the county’s first dual pressure CNG station. Pearson featured San Diego’s largest Electric Vehicle charging facility, the county’s first Propane Vehicle Fueling Station and was the first independent station in San Diego to offer Ultra Low Sulphur Diesel. Three grades of gasoline rounded the offering to a total of 10 different vehicle fuels. This was the first time a facility like this had ever been built. The original concept for Pearson Fuels grew out of the Clean Cities Program. The Clean Cities Program is a government-industry partnership designed to reduce petroleum consumption in the transportation sector by advancing the use of alternative fuels and vehicles, idol reduction technologies, hybrid electric vehicles, fuel blends, and fuel economy measures. The Clean Cities Program was established in 1993 with its first designated coalition located in Atlanta, GA.